It is early Wednesday and I already feel swept into the vortex of this coming weekend and the upcoming Harvest Gathering. Close friends are arriving and most of my home work preparation is finished. After all, I did the whole remake of the studio, mostly by myself, setting some twenty years of accumulation-drift back into line. The studio rooms are all bright and clean. What still needs sorting through was put in boxes and metaphorically swept into a corner for deep-winter dispatch. I am good to go. And go I shall, as chief chauffer for at least three or four people, ferrying them back and forth from our home here in Big Rapids and the gathering up on the farm near Lake City. I better get my rain gear out because at this time of year there is no telling whether the weather will be warm and dry or cold and wet, usually some of each. Yesterday afternoon I helped finish (installed the hanging hooks) on a group of framed paintings (large pieces) by my very talented daughter Anne. They will hang in the barn stage up at the gathering and are up for sale. If I find time I will post some photos of the paintings here, so that you can see them, but I include one of them. This is large (living-room size) and quite lovely. I just made a huge pot of vegetarian chili, even though it is the middle of the night, fuel for guests. Last evening Margaret made a lot of humus, so there will be food around. My granddaughter Emma and her mom have been staying with us and Emma's mom (who is an accomplished artist) is teaching Emma how to paint. 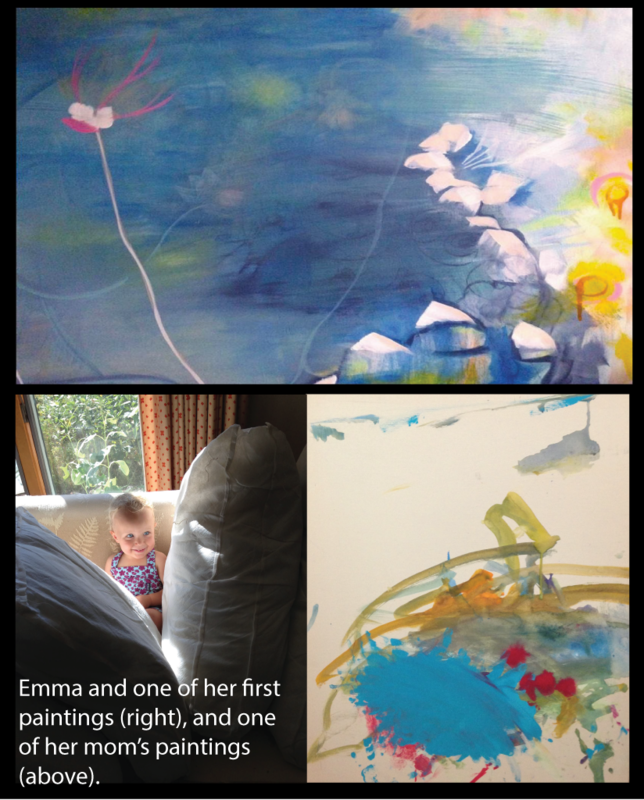 I include one of Emma's first paintings here, plus a painting by her mom. Mom's painting is large and now sits in a lovely hardwood frame. It is very nice and will go on sale this weekend. If anyone is interested, message me. Anyway, that's it for the middle-of-the-night folks.